Crêpes vs. European pancakes vs. US pancakes... First of all, "pan cakes" (baked in pans or on stones) are probably the earliest and most widespread cereal food eaten around the world since prehistoric times. The pancake's shape and texture varies around the world. The biggest difference between "crȇpes" and other pancakes, is that crȇpe batter has to rest for hours before use, whereas regular pancake batter is used immediately. 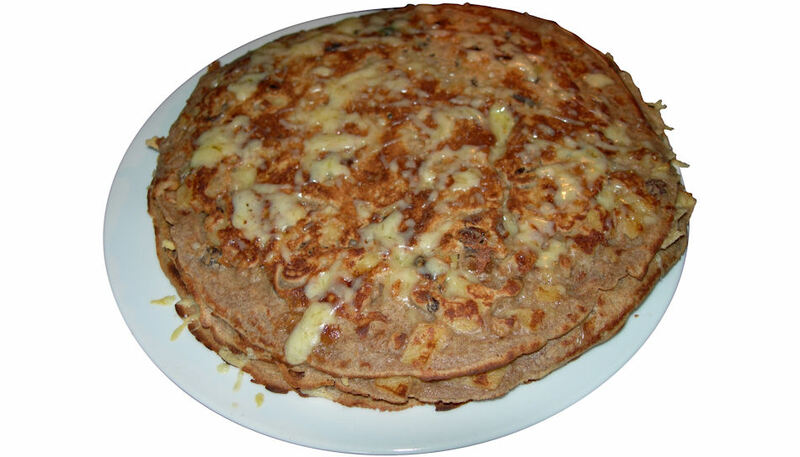 And crêpes are from a specific region (Brittany); they are thin, and are cooked on one side or both. "American" pancakes are basically just large Scottish pancakes, a.k.a. drop(ped) scones. They have the same basic ingredients as their "European" roots (flour, eggs, milk, butter). However, they also have a rising ingredient - usually large amounts of baking soda or powder. 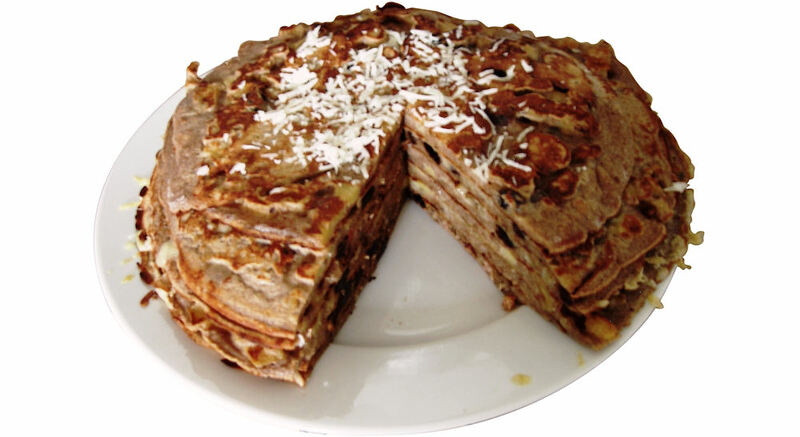 This type of pancake is thick, fluffy, and small (6-8 inch, 15-20 cm). In the US, they are usually served at breakfast only. A couple of "fancy" US pancake recipes are here. What type of pancake is "best"? That all depends on your taste. For most people, this is simply (and unfortunately) determined by what they grew up with. As we say back home: "what a peasant doesn't know, he won't eat!". I do know how I like my pancakes! And the only way to make decent pancakes, is from scratch! No pancake-mix stuff please!!! Stacks, pie piece, so everyone gets part of all of them (and at the same time), plus the layer effect with cheese in-between. What is commonly called ginger "root" is actually not a root, but a "stem". First of all, it does not perform the function of roots (i.e., anchorage and absorption of water and nutrients) but provides storage of food for the plant. Also, it has (inter)nodes. More precisely: it is a "rhizome", i.e., a continuously growing horizontal stem, that puts out lateral shoots and adventitious roots at intervals. Stem ginger is young ginger, that has not yet become fibrous, tough, and hard. It is milder than the rest of the "root". This is the choice piece of the stem of the ginger plant. It is peeled and preserved in sugar syrup, or candied (crystallized ginger). I definitely prefer "Thompson" raisins over "Sultanas"
Put the flour (regular + buckwheat) in the medium size bowl and whisk (to loosen up the flour and eliminate clumps, if any. This is a lot quicker and easier (incl. cleaning) than using a sifter). Add the flour, while continuing to beat, until a smooth batter is obtained. Avoid over-mixing: this can lead to rubbery pancakes. Lower the heat to medium (these pancakes are relatively thick and take time), add batter, and see how it cooks. By the time the edges of the pancake become dry, small bubbles will start to form in the batter and collapse. With a flipper, carefully lift up the pancake and check the underside: it should be golden brown. Flip the pancake over, and cook until golden brown on both sides. You may try and toss the pancake in the air and try to catch it upside-down with the frying pan, without breaking the pancake and making a mess of your kitchen. I simply slide the pancake from the frying pan onto a large plate (or the flat lid of a large saucepan or frying pan), and then hold the frying pan at an angle and flip the plate with the pancake so as to drop the pancake into the frying pan. Put the pancake on plate that is in the oven and sprinkle some cheese over it.